One of the first questions many of our clients ask is, “how long does probate take?” You may expect (and hope) for the process to be quick and painless, but that’s not always the case. Based on our many years of experience, the answer is: 2 months to 3 years, typically 15 months. 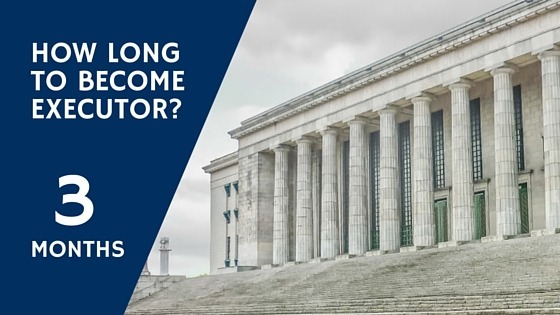 How Long Does it Take to Become Executor of a New York Estate? 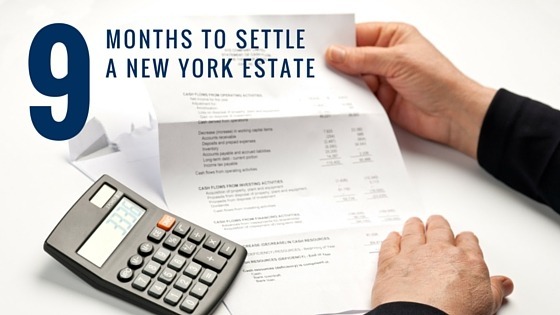 How Long to Settle an Estate in New York? How Long to Close an Estate in New York? We hope these explanations and examples help you understand your road ahead. The short answer: 2 to 6 months. Typically 3 months. In the best-case scenario, getting your letters testamentary will take just 2 months. But typically, it takes 3 months to get a court appointment, even in the most straightforward and simplistic cases. This extra wait is due to the time it takes to collect the necessary client information, prepare and sign the appropriate court documents and then submit everything to the court for processing, which can take anywhere from 4 to 8 weeks. Once the court has accepted all of these documents, the court will grant your letters testamentary or letters of administration. Getting family members to sign and notarize documents should be the easiest and quickest step of the probate process, right? You may think this will take just a day or two. After all, these are loved ones that will be happy to help. Unfortunately, in many cases this is not true. You have to collect signed and notarized documents from a number of parties including heirs, friends of the family, and sometimes even disinherited family members. Although many of these individuals seem to be happy to help, getting the paperwork back from them requires a lot of follow-up to the point where you may even have to offer to bring a mobile notary to their home for their convenience. The courts normally take around 4 to 8 weeks to process court papers, however it can take much, much longer in some cases. Why is there such a wide timeframe? Maybe the clerk handling your case went on vacation or was assigned to a different county court. Or, maybe your paperwork was never processed because it fell behind the clerk’s desk and no one noticed (this actually happened!). There are so many factors that could add court delays, and the worst part is there’s no way to predict which will occur. The best advice we can give you is to try and be very responsive for anything that’s under your control (such as signing documents), to time-budget for these court delays, and not to expect a quick turnaround. In some situations, the probate court must appoint a third party, either a Guardian Ad Litem or a Public Administrator, to investigate and prepare a special report. Each time a third party is included in a probate case, it means at least one court date will be required plus however long it takes for them to complete their investigation and report. So you’re usually looking at an additional 2 or 3 months, or longer. Example: Gertrude was probating her uncle’s will, and as part of the procedure we had to notify a distant cousin whose whereabouts were unknown. In this case, the court assigned the Public Administrator to conduct its own investigation to confirm that we made a diligent effort to find this missing cousin, and to submit a report of their own findings to the court. Setting a court date to appoint the Public Administrator added 2 months, and it took them another month to complete their report. Once you’ve been appointed as executor or administrator, you must now begin fulfilling your duties and settling the estate. Note: If you’re both the executor and the sole beneficiary, then you basically stop here. The following 2 steps don’t really apply, since you’re really just collecting the assets for yourself. And there’s no need to formally close the estate, since you’d just be reporting to yourself. The short answer: from 7 months to 3 years. Typically 9 months. Estate settlement (also known as estate administration) is the phase during which you, as the court-appointed executor, must collect the estate assets, organize and pays debts, and file all final taxes. At a minimum, you must wait 7 months from the date of your court-appointment before closing the estate. That’s the deadline for any unknown creditors to make their claims against the estate. You know those frustrating court delays we mentioned above? The same applies to banks, insurance companies, and other bureaucracies involved in the estate administration phase. Sometimes, you may get lucky and your paperwork will be processed and tasks completed right on schedule. However, this is often not the case. Example: Randy, brought us a very simple probate case that should have taken the bare minimum of 7 months to settle. During estate settlement, Randy asked the IRS for confirmation that all of the Decedent’s past tax returns had been filed. But for some reason the IRS had trouble matching the Decedent’s name with his address, which completely put a halt to the probate process. What should have been a simple request to the IRS ended up delaying Randy’s case by over a year! These kinds of hold-ups can be incredibly irritating because you have no control over the situation and can’t do anything but continuously follow-up until it’s resolved. Another factor that can cause delays in settling an estate? Illiquid assets. When your estate contains assets that are difficult to sell, such as shares in a private business or any real estate property with occupants who refuse to leave, your estate administration will be delayed. Example: Anna appointed us as executors of an estate with assets that included a number of real estate properties. Although we sold most of the properties easily, one rental property had tenants who refused to leave. Thus, we were forced to begin eviction proceedings in New York, which can take six (6) months, usually much longer. If an estate tax return is required, the total probate process will usually take between 18 months to 3 years. 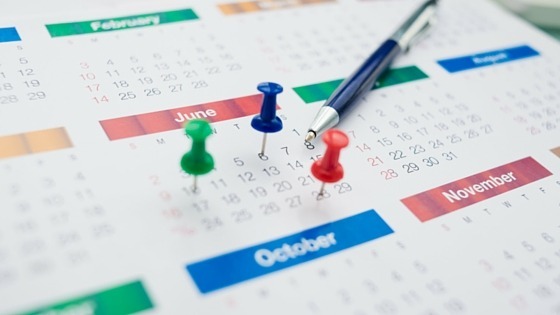 You, as executor, may not distribute to the heirs until you’ve received a closing letter from the tax authorities, which may take several months or even years. The short answer: from 1 month to 1 year. Typically 3 months. 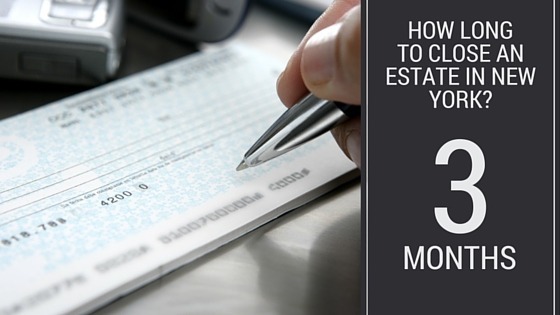 So you’ve completed estate administration and settlement, and it’s now time to close the estate. In most cases, the beneficiaries are eager to receive their inheritance checks and are eager to cooperate and sign the closing papers. But not always. Here are some examples of why the last stage can drag up to 1 year or more. To close the estate, you must collect signed court forms from each beneficiary to ensure that the Executor is completely off the hook. But just like when you needed to collect signed documents to get appointed as Executor, sometimes folks just can’t be bothered. Example: When we assisted Amanda with settling her grandmother’s estate, 3 out of the 4 heirs signed the closing documents without any issue. However, Jimmy dragged his feet for weeks and weeks. Finally, Amanda showed up at Jimmy’s house and forced him to go to the bank to get his documents notarized so the heirs could finally receive their inheritance checks. Jimmy caused all 4 heirs almost a 2 month delay for no real reason! At the end of the probate process, you must circulate a financial report (called your Accounting) to all of the heirs that details all of the transactions and activities of the estate. This is one of the final steps before officially closing the estate. If even one heir doesn’t agree with the numbers in the accounting and wants to contest, you must ask the court to decide if your accounting is correct, and those court proceedings will delay the closing by about a year. When someone disputes that a will is valid, known as contesting the will, this adds onto the time to close the estate. Sometimes, the contest is not even valid and is just a result of a disgruntled heir angry that she was not included in the will. Regardless of whether or not her argument is valid, any kind of will contest can delay closing the estate by months, or even years. Keep in mind that all of these estimates are based on clients guided by good probate attorneys or professional executors. 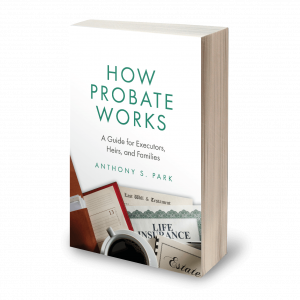 Our clients rely on the team at Anthony S. Park, PLLC because of our years of experience and knowledge about the entire probate process. Going through the probate process on your own usually requires even more time, and leads to frustrating complications. Contact us today for a no-cost consultation about getting started with your probate case.